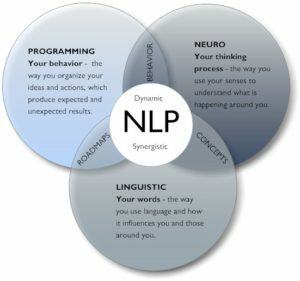 Neuro-linguistic programming (NLP) is a solution based approach to communication, personal development, and psychotherapy created by Richard Bandler and John Grinder in the 1970s. It focuses on changing limiting self-beliefs and negative thoughts to achieve specific goals. Neuro relates to your neurology: your brain and nervous system. It relates to how you give meaning to your experiences. Linguistic relates to language. The words you use give meaning to your experience. They can also shape your experience. Using the right words will light up your neurology in a positive way. Programming refers to your strategies for dealing with life: your patterns, habitual emotions and belief systems. These determine your actions, behaviour and also influence how you feel. They play a role in how you respond to events, and how you achieve your goals. NLP can treat problems such as stress, phobias, depression, habits, psychosomatic illnesses, and learning disorders, often in a single session. In conjunction with resolving various issues, NLP is future focussed for setting goals and creating life choices such as attracting relationships and financial success. The processes for these results involves releasing past issues, resolving childhood trauma and setting up positive goals. Through a variety of techniques, including timeline therapyTM and positive subconscious programming, impressive, fast results are attained. How can Melbourne Natural Medicine Clinic help you?